Like a similar image posted last year, I believe this is a Northern Mockingbird (Not Woodpecker!!) , who apparently likes to ride on my weathervane. Calling him “Klingon,” and wondering how he “gets a grip,” he brazenly sang a happy tune as he swung around, inspiring me to focus on his …sharp little claws. 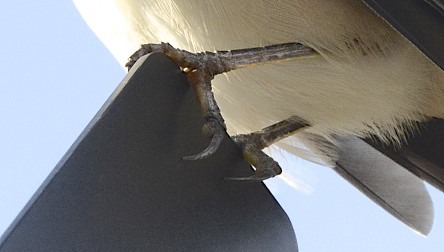 In fact, there is a small scratch on the surface, just under his sharp little left, rear claw. Here’s some photos . 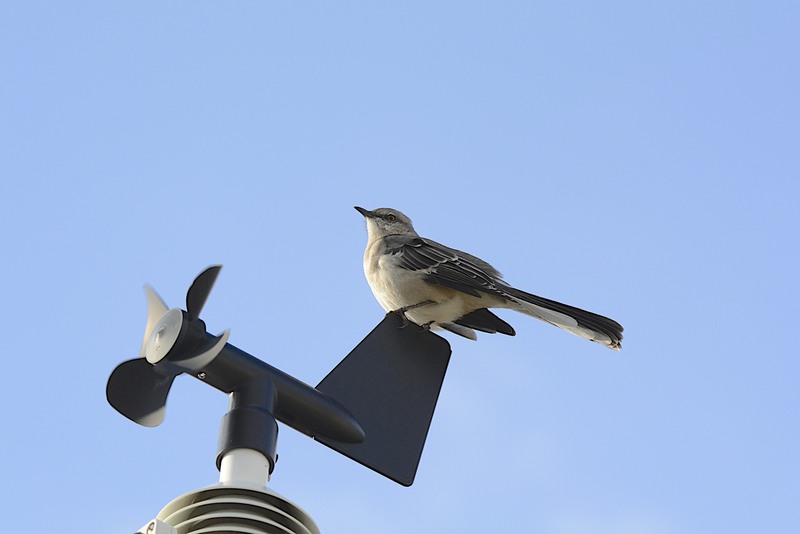 . .
We have Northern Mockingbirds here in San Diego, too. They are a lot of fun to watch when an osprey or kestrel comes their way. They just don’t like those raptors. Your wildlife photos are always a treat, M. We also have a resident mockingbird who happens to love singing through the night on the wire outside our bedroom window. Good thing he has a nice voice!